Carlie has an extensive background in fitness, she more recently discovered all things aerial and absolutely fell in love. 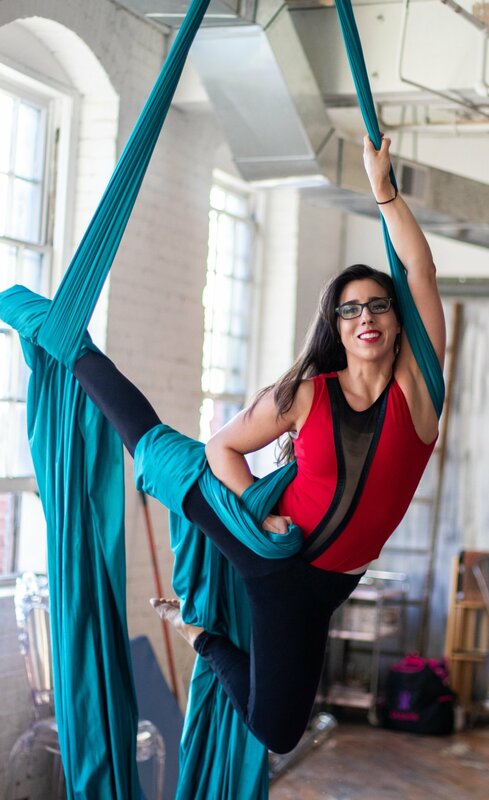 For the past two years Carlie has been working with Bangarang Circus focusing on Silks, Lyra, Hammock, and acro yoga. She also enjoys swing dancing and anything to do with adventure! When she's not flying high she can be found rock climbing, surfing, or working at Holland Hospital. Carlie is very excited for what she can bring to the table at Zeal! Kendra Garcia brings her 9 years of experience as a competitive artistic gymnast to her study and performances in the circus arts. Kendra specializes in aerial silks, hammock, Lyra, static trapeze, rope, chandelier, cube, and partner acrobatics. She has been performing locally since the beginning of 2016. In addition to her passion for the circus arts, Kendra is currently obtaining a degree from Michigan State University's College of Human Medicine in hopes of pursuing a career as a specialist in allergy and immunology. Amy has an extensive background in dance and fitness. She has competed, performed and placed nationally in figure skating, swing dancing, and pole dancing. She has been pole dancing since 2009 and loves the artistry and strength of the sport. When Amy isn’t dancing she works with her husband, Colin, in their business Skinner Masonry and Concrete. Amy also barrel races horses and is a bonus mama to two beautiful girls. I have been passionate about health and fitness since I was a young girl and have long been an avid runner and soccer player. In 2014 I obtained my personal trainer certification through American College of Sports Medicine and love helping other people achieve their fitness goals. I also enjoy music (singing and playing piano and violin), the outdoors, hiking, plants, dabbling in photography, and spending time with family and friends. I also enjoy a good challenge - especially when it comes to exercise! Growing up, I always wanted to fly. When I moved to Utah for a job, I found a gym that gave me that feeling. I fell in love with the Aerial Arts from the minute I stepped up to the mats. My goal for you all is to find a form of fitness that you love, that inspires you, and motivates you to be the best version of yourself. Through aerial fitness, I found a way to truly connect to my soul and I wish to open that door to others and to change the culture and stereotypes around this type of fitness.